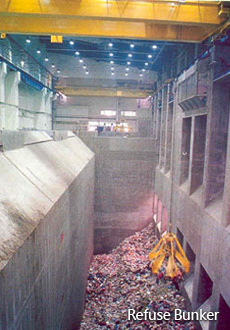 In the refuse reception hall, the refuse is discharged into the bunker through one of the refuse discharge bays. Shulin Plant have 12 bays respectively. Bulky wastes are discharged into a separate pit for crushing. 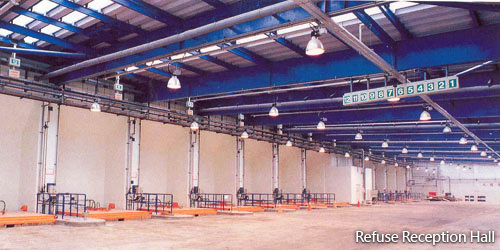 The discharge bays are provided with hydraulic operated doors, which can be controlled manually or automatically. The refuse bunker which is fully enclosed has a capacity to store about 9,000 tonnes of refuse in the Shulin Plant. Two overhead grab cranes feed refuse from the bunker into the incinerator hoppers. Each grab has a capacity of 7 cu.m. The cranes are operated from the control room, which oversee the entire bunker.